(P1) A train station close to your home would be for most commuters a nice thing. In Hanoi though, things got a little bit too close. 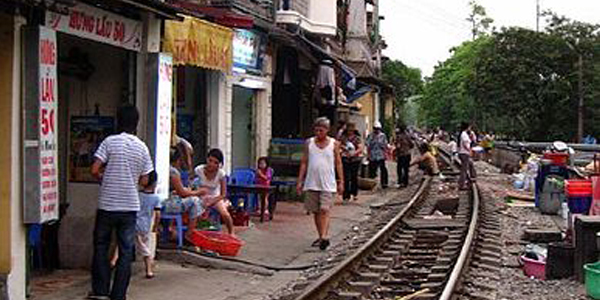 (P2) In the Vietnam capital city, there is a street where trains pass right in front of people’s doors. Only centimeters separate the train and the houses. The train goes through the narrow street every day at 4 pm and at 7 pm. Residents usually hide because there have been accidents in the past. (P3) Living there cannot be very nice, mainly because of the noise and also for security reasons. How would you feel if you lived on that street? Do you have any bad streets in your hometown? If yes, describe the street. Do you think living there is safe or unsafe? Why? The train passes by houses in the city of ___________. At what time of the day does the train pass by the houses? The people who live there normally _______ when the train passes through. What are the 2 reasons given for not wanting to live on that street?